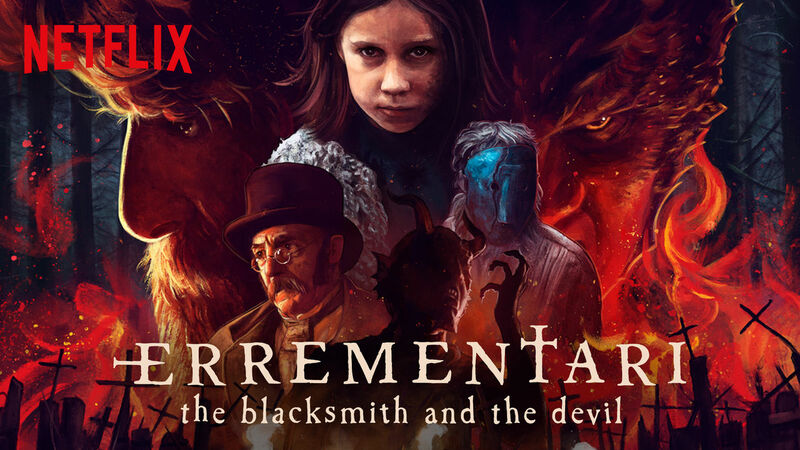 Paul Urikjo Alijo’s debut feature, Errementari: The Blacksmith and the Devil, actually debuted at Sitges last year. The film then toured the horror/fantasy festival circuit to plenty of acclaim before it landed on Netflix. It is a matter of thorny debate how good streaming services are for films like this and the detrimental effects of the likes of Netflix on the festival circuit. It would be accurate to say though that being on the streaming giant gives a chance for movies such as Erremantari to be seen by more people which is a good thing as this is a little gem of a film that deserved to be seen by a wider audience. The story takes places in a small Spanish village in the 1840s where an investigator (Ortzi Acosta) arrives to investigate the disappearance of some gold that was stolen during the First Carlist War. His chief suspect being Patxi (Kandido Uranga) a hermit blacksmith who the rest of the village appear to fear. The investigation is beside the point though as this fable-like tale focuses on Patxi and a deal he made with a demon Sartael (Eneko Sagardoy). Not that this is a spoiler as we are told of the blacksmith’s demonic pact in the beautifully animated prologue. The other main focus is Usue (Uma Bracaglia) a rebellious little girl whose mother killed herself. Given this is a Spanish fantasy-horror seen mainly from a child’s point of view it is hard to escape the Del Toro comparisons. This story even touches a bit on the same themes of grief, loss, and oppression (state & religious) as the likes of “The Devil’s Backbone” and “Pan’s Labyrinth.” However, it does so in a more heavy handed, broad brush strokes manner. Which is not to say it does not tell its story as well as it remains entertaining throughout. The film is unusual as well as it is Basque language films which is a rarity (there is an English dub but many have noted this make it seem silly and you are better sticking with the original language with subs). Tonally the piece is curious as it starts as a brooding Gothic fairy tale but becomes more comical as the plot unfolds particularly after the introduction of Sartael. This tonal shift is not a bad thing necessarily as Sagardoy chews the screen with maximum glee (as the demon who looks not dissimilar to Tim Curry’s Satan in “Legend”). They say the devil gets all the best lines and that is certainly true here. You can’t help but feel though that film is strongest in its opening half when the focus is on the more human stories on Patxi and Usue. Both of whom are played superbly by Uranga and Bracaglia respectively and form the beating heart of the film. Concerning the other characters, much of the rest of village though is your stereotypical torch-wielding yokels that generally populate fairy tales. The film does end on a high though with a hell set finale which is beautifully staged and impressively done particularly given its budget level. Overall: Despite the tonal inconsistencies and clichéd elements this is a thoroughly entertaining fantasy-horror tale told with real brio and complete with visual imagination and a trio of enjoyable performances from Uranga, Bracaglia and Sagardoy.